Non-Western Encounters with Democratization offers diverse perspectives on democracy and transition spanning the Middle East and North Africa to East Asia. This unique collection of essays, drawn from contextually rich case studies presents readers with a variety of non-western encounters with democracy and provides important insights into the dramatic political and social transformations in these regions over the past decades. The book offers a deeper understanding of democratization and challenges the image of western democracy as a universal model to which non-western societies aspire. Taking the events of the Arab Spring as the starting point, international contributors look at why the uprisings that rapidly spread across North Africa and the Middle East had a strong resonance in East Asia but failed to inspire similar revolts. 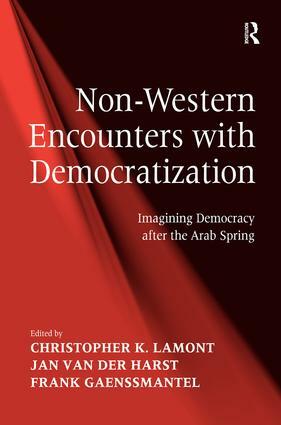 Through direct engagement with non-western experiences of political transition the book demonstrates a unique coherence across two regions relatively under explored in democratization literature. Christopher K. Lamont is an Assistant Professor of International Relations in the Department of International Relations and International Organization at the University of Groningen. He is also co-Chair of Research in Ethics and Globalisation, a research section within the inter-faculty research institute Globalisation Studies Groningen. He has published widely on transitional justice and international criminal law. His book International Criminal Justice and the Politics of Compliance was published by Ashgate in 2010. Jan van der Harst is Professor in the History and Theory of International European Integration in the Department of International Relations and International Organization at the University of Groningen. He received his PhD at the European University Institute and has published widely in the fields of European integration, Dutch Foreign Policy and EU-China relations. Frank Gaenssmantel is Assistant Professor of International Relations in the Department of International Relations and International Organization at the University of Groningen. He has previously held a position as Research Fellow at the Centre for Advanced Studies on Contemporary China in Turin (2008-2010) and taught at the School of Advanced International and Area Studies at East China Normal University in Shanghai (2004-2006). His research interests include foreign policy analysis, European and Chinese foreign policies and China-EU relations.